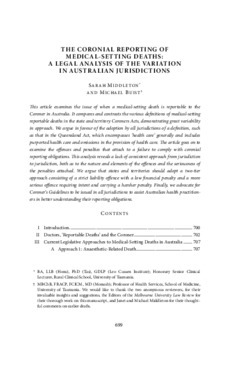 This article examines the issue of when a medical setting death is reportable to the Coroner in Australia. It compares and contrasts the various deffinitions of medical-setting reportable deaths in the state and territory Coroners Acts, demonstrating great variability in approach. We argue in favour of the adoption by all jurisdictions of a deffinition, such as that in the Queensland Act, which encompasses 'health care' generally and includes purported health care and omissions in the provision of health care. The article goes on to examine the offiences and penalties that attach to a failure to comply with coronial reporting obligations. This analysis reveals a lack of consistent approach from jurisdiction to jurisdiction, both as to the nature and elements of the offiences and the seriousness of the penalties attached. We argue that states and territories should adopt a two-tier approach consisting of a strict liability offience with a low ffinancial penalty and a more serious offience requiring intent and carrying a harsher penalty. Finally, we advocate for Coroner's Guidelines to be issued in all jurisdictions to assist Australian health practitioners in better understanding their reporting obligations.